To make your kid physically active and fit, you should choose a game which s/he can play even after s/he grows up and soccer is such a game. Soccer not only makes the player healthy and strong, but also develops a team spirit and sportsmanship. In soccer, next to ball, what is important is the soccer goal. Let’s see how to choose one. To choose the perfect soccer goal for your kid, you should first consider what the goals will be used for. There are roughly two types of goals – stationary and portable. Stationary goals are obviously used for the actual game, while portable are more suitable for your young footballer because you can take it anywhere, like park, beach etc, for him to practice or for recreational purpose. Find a variety of them at Step2 Direct. Plastic Frame: These are lightweight and are available in several sizes and shapes. Typically they are meant for practice and training. They can be much smaller than a full-size goal and some can even be dismantled to transport to another location. 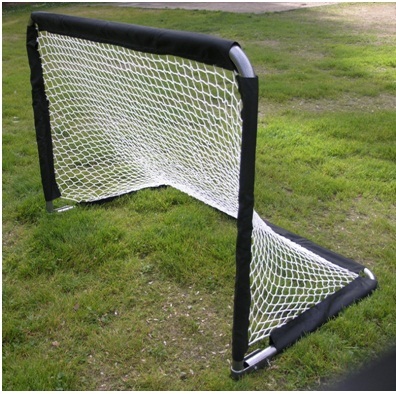 Along with regular goals, you can also get kick-back goals with a plastic frame. They are characterised by tight netting that bounces the ball so that the player can practice. Metal Frame: These are heavy and are meant to be placed permanently in one location. They are often made of aluminium and can weigh up to or more than 300 pounds. They are the goals that are used for actual game play. As they are heavy, they don’t shake when the ball hits them. They are also weather resistant. Without Depth: Here the net is attached to the front crossbar and descends immediately making a 45° angle with the ground. It is then anchored directly in the ground or secured to another bar on the ground. 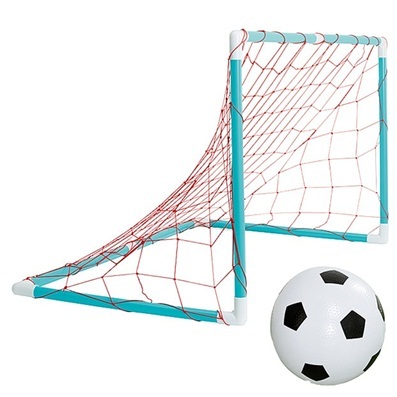 This is the lightweight kids soccer goal and can be moved easily if desired. With Depth: Here there is a rounded frame extending for around two feet behind the crossbar. Thus the net extends to this frame and then descends making a 45° angle to another bar on the ground. This shape allows more room inside the goal and also is more stable. As per the size, it can be light enough to move around or heavy to remain stationary. Box Shape: These are the heaviest types of soccer goals. They are shaped like a rectangular box and the net hangs over it and descends making a 90° angle to the ground. They are used by professional soccer leagues and are meant to be placed permanently in the ground. Nets wrap around the goal from all sides except the front. Their job is to catch the ball. Its quality will largely decide how long it will last. The thickness of the net, material and size of mesh will decide how well it will stand the weather. Hopefully this information will help you choose the right type of soccer goal for your kid which s/he will enjoy playing with.